Set amid stunning mountains on the west arm of Kootenay Lake, Nelson is the largest centre in the Kootenay Country. Once a prosperous mining town, Nelson is now noted for its vast numbers of restored heritage buildings and a well documented history. It is located 43 km (27 miles) east of Castlegar on Hwy 3A, and 40 km (25 ml) north of Salmo on Hwy 6. Explore any of the 350 heritage buildings in the area including the Nelson Courthouse and City Hall or view artifacts at the museum and Chamber of Mines of Eastern British Columbia. The Visitor Infocentre will provide maps and more information. This recently restored electric tram gives visitors a chance to view the town from its lakeshore route. Stroll along this lakeshore walkway to sandy beaches, picnic and play areas, nature areas and a greenhouse. Follow Hwy 3A to Balfour where a car and passenger ferry across Kootenay Lake will take visitors to the town of Crawford. Highway 3A then leads its scenic route along the lake to Creston. Instead of continuing along Highway 3A, you may choose to follow Highway 31 which leads past Ainsworth Hot Springs. Canada's highest mineral content hot spring with a pool temperature of 45 degrees C (over 100 F) offers visitors a fabulous view of the lake. It is open year round. North of the hot springs follow a gravel road which leads to the caves. Guided tours are available. 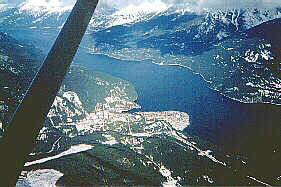 Further north on Highway 31 is the village of Kaslo, first settled during the 1890's silver strikes. Now a peaceful resort community on the shores of Kootenay Lake, visitors may enjoy the excellent fishing or explore the historic buildings and relics of yesteryears. This is the oldest passenger sternwheeler in North America. Now completely restored as a museum, it has been named a historic site by the Historic Sites and Monument Board of Canada. From Kaslo, visitors may continue along Highway 31 to Galena Bay which is a slightly more isolated and rougher route. Alternately, follow Highway 31A to New Denver, Highway 6 to Nakusp and Highway 23 to Galena Bay. From Galena Bay onto Shelter Bay and Revelstoke in the High Country. At the junction of Highways 31A and 6 on the eastern shores of Slocan Lake is New Denver. Once a mining town, it is now a centre for anglers and boaters, hikers and skiers. Further along Highway 6 is Nakusp. Situated on the Upper Arrow Lake in the Selkirk Mountains, Nakusp offers visitors a new marina, 9-hole golf course, driving range and waterfront walkway and park. Enjoy the nearby hot springs (just off of Highway 23 north of town) or angling for kokanee, Dolly Varden and rainbow trout in the lake. The name Nakusp is an Okanagan Indian word meaning "closed-in". 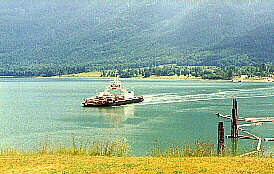 South of Nakusp on Highway 6 is a ferry which crosses the Lower Arrow Lake to Needles. Further along are Cherryville, Lumby and the Okanagan. Alternately, continue back along Highway 6 to New Denver, Slocan, South Slocan and the Highway 6 Junction to Nelson.